The Society’s collection includes a three inch reflecting telescope, a photograph of which graces the front cover of this Annual Report. It was bought in 1761, clearly for use by the Society’s members. The instrument is marked “B Martin, Fleet Street”. Benjamin Martin dealt in a wide variety of scientific instruments, mostly as a retailer. His shop in Fleet Street was close to the premises then used by the Royal Society, which may have provided him with a ready supply of customers. The telescope was purchased with two microscopes and an air pump. It is possible that all were supplied by Martin, but unfortunately the telescope is the only item that has survived in the collection. A reflecting telescope uses curved mirrors to focus the light rather than the lenses of “normal” telescopes. The light passes down the tube of the instrument and is reflected back to where it is again reflected by a smaller mirror to the eyepiece which is in the middle of the primary mirror. These multiple reflections allow an instrument of manageable size to have a much greater effective length. Our telescope does not compare with the largest ones of its time, but it would have been capable of being used for making important observations. Even today, some amateur astronomers have instruments which enable them to contribute unique scientific observations. Unfortunately, the Society’s minute books were not at that time maintained as well as they had been before, and we have no record of the uses to which the telescope was put. However, earlier minute books do include records of astronomical studies. Astronomy was clearly an interest of several members, and they reported on their observations, often in considerable detail. 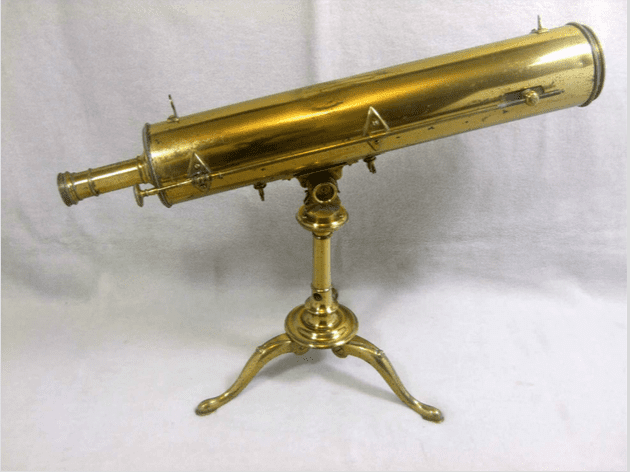 It is clear from several of the comments that some members had telescopes of their own that were advanced enough to make useful observations. Indeed, some of these early members were making observations and writing to a standard that ranks them with the leading astronomers of their day. 1734 Mr Bogdani gave an account of a new star “in appearance as bigg as Venus”. 1740 Mr John Grundy donated to the Society a copy of “The Use of the Globes” with propositions in astronomy geography and dialling [probably about sundials]. 1742 Dr Roger Long, master of Pembroke College donated a copy of his five volume “Astronomy”. 1735/6 an eclipse of the Moon was reported, with comments that the sky took on an appearance similar to the Aurora Borealis. In 1738 and 1739 there were reports of meteors. 1739 a description of the expected appearance of a partial solar eclipse on the 24th July. 1737/8 and 1744 references to the appearance of three suns, known as “parhelii”. This is now known to be caused by unusual atmospheric conditions. One of the minute book references has been illustrated by a small print showing this appearance of the phenomenon. 1746 a report of detailed observations and timings of a total eclipse of the Moon. 1746 two different reports of sunspots, one of seven spots in March, and one of 21 spots in July 1745. 1746 Dr Stukely reported seeing the Aurora Borealis (Northern Lights) at Grimsthorpe. 1750 A detailed set of observations of the occultation of Aldebaran by the moon in 1737. It is possible that some of these observations may not be reported elsewhere, and could add to the early astronomical record?